The last PPC campaign I analysed in the ‘Analyse A Real PPC Campaign’ series was from LinkedIn, who used PPC to push web traffic into viewing jobs on their social media platform. Although not the most targeted of PPC campaigns, it did allow people to browse their website and explore the social media platform for developing careers (which is likely to be an objective by LinkedIn for the PPC campaign). Supermarkets are in a fierce market to compete in, especially since home delivery is now an option. Looking into this sector, here is an analysis of a PPC campaign from Ocado, about Waitrose. Ocado have decided to bid on a supermarket’s brand name which is an interesting approach to their campaign. Waitrose offer free delivery on all their food orders, which is stiff competition for Ocado to compete against. However, from targeting those wanting to shop at Waitrose, they are hoping to lure people from even interacting with the official Waitrose website and going straight to their website, where the only difference is in the delivery service of the food. It is very clever of Ocado to include a financial incentive too. 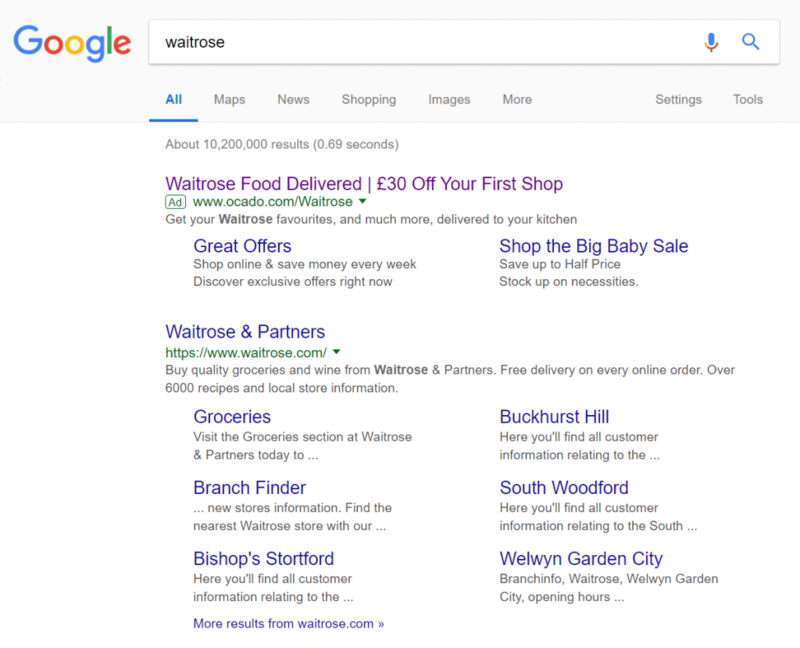 This makes it almost impossible to not click on the advert if web users searched for Waitrose to do an online weekly shop – why would they click on the top organic link if they can go to Ocado, buy the same stuff from the same supermarket and get a discount in doing so too? It’s a no brainer and a clever advertising technique deployed by Ocado. Ocado’s landing page is very similar to the likes of Amazon, in the sense that there are many images, links and content to click onto so that the web user can find the item/s they want to purchase. This reduces the chances of an exit from the web user if they can likely click onto something that will be of interest to them. As much as this is a good landing page to start shopping on and purchasing items for a home delivery using Ocado, I feel that they are missing something extremely important on this landing page: Waitrose and their logo. People shop at Waitrose mainly because of the name of Waitrose and the products of Waitrose being of high quality. 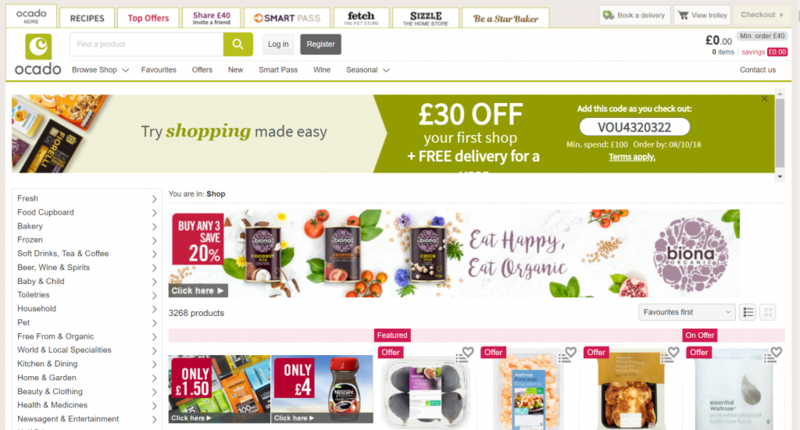 If there is nothing indicating that the products are specifically Waitrose own brands above the fold of the page, then there is little incentive for the web user to want to shop with Ocado. Although the reason for not including the brand might be because of copyright etc., it is important to mention the name Waitrose and their food somewhere bright and bold on this landing page. Part of the reason people choose Waitrose as well is for the enjoyable shopping experience, where there is free tea/coffee upon entry whilst you shop etc. Ocado have not managed to replicate this on their landing page (of feeling special), which goes a bit against the values of the Waitrose brand. This in turn would not help the conversion rate of this PPC campaign.